FAMILY RECIPE The candy-making business is a return to their roots. Nick’s grandfather and great-grandfather emigrated from Greece and apprenticed in New York to learn the candy-making trade. From there, his grandfather opened a small candy store in Clinton, Iowa, but none of his children followed in his footsteps. Nick and Terry met when both worked in technology for a federal agency on the west coast. They married and Terry eventually stayed at home to raise their six children. 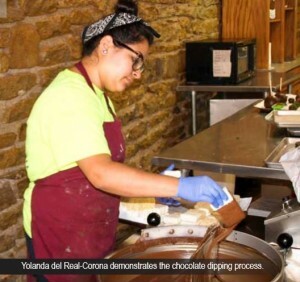 A job for Nick at Sprint brought the family to the Midwest, where Nick eyed a failing candy store in Odessa, Missouri, and thought he might recreate some of his family memories. They ran it for a little over a year at a loss. STIRRING THE POT The family graduated to Topeka in 2004, when Nick took a position with Security Benefit. A trip downtown inspired a sweet idea. “It seemed like (a candy store) would be a nice addition to a downtown that seemed like it was really struggling,” Nick said. In March 2005, they opened the store at 724 S. Kansas Ave. bearing the name of Terry’s grandmother, Hazel Hill. “When (Nick) first started, he thought he could still manage it and work a full-time job. I didn’t realize it was an attempt to get me back to work!” Terry joked. Terry operates the store as general manager, while Nick does payroll, taxes and other behind-the-scenes duties. They’ve kept the same Monday thru Saturday hours the entire time they’ve been open. SWEET SUCCESS It would seem that consistent approach has paid off. Hazel Hill started with two employees and now has three full-time and eight part-time positions, plus extra help hired over the Christmas holidays. They’ve opened a second retail store in Manhattan. In addition, they estimate about a third of their sales come through gifting and shipping. The way people eat up what they offer sometimes surprises them, especially in the beginning. The key point to organizing is ordering. Terry knows they’ll need 150 pounds of sugar a week. She orders 2,000 pounds of chocolate every two months. At Christmas, she’ll quadruple the amounts. They’ll use 50 pounds of apples a week, and, at Valentine’s Day, ordered 40 eight-pound flats of strawberries— and still needed more. You can expect a fresh, 20-pound batch of their special popcorn each day. In November, Terry and her workers will begin making 100 pounds of each type of nut cluster the store offers to get through the holidays. Of course, there are still plenty of hectic moments. Terry says a crew often works until midnight around Christmas, mostly putting packages together, and, since strawberries must be dipped fresh, they pull an all-nighter before Valentine’s Day to prepare the special treats. “We just have to be ready,” she said. SAVORING THE MOMENT As gratifying as the success is, though, Terry and Nick agree any growth must be tasteful. On one hand, the consideration is financial. The couple has pledged to keep the business self-supporting, putting profits back into the store so they can pay as they go. The other, perhaps more important, priority is the product. To that end, Hazel Hill will continue to offer its favorites. You’ll find homemade caramels, a variety of truffles, the signature Snickers apples and “anything with pecans.” Plus, Terry will continue experimenting, often with input from customers. That’s how chocolate-covered bacon found its way into the display case and how “things” came to be—a variety of chocolate-dipped balls with a moist cake center. The customers are what it all comes back to for Terry and Nick. “The customers bring me a lot of joy,” Terry said. For them, Hazel Hill will remain, not just a store, but an experience.